Regardless of whether you’re a newbie or a veteran to working out, you can save money and time by using a home gym. So, how does Golds Gym Platinum Home Gym stand up? I quickly realized this home gym was made for people new to working out. Anyone with some lifting experience looking to use heavier weights would be very disappointed. The construction simply isn’t sturdy enough to handle the weight. So, you’d be better off spending extra on a home gym that can withstand more weight without feeling flimsy. I’d recommend the StrengthTech EXM2500S Home Gym for serious lifters. Golds Gym Platinum Home Gym is built for newcomers who don’t need to use a lot of weight to build muscle. The range of equipment available lets you get effective full-body workouts. In the beginning, you won’t have to use heavier weights, so this gym will feel great and stable. 1 What Are Customers Saying About It? The one review from Walmart rates this home gym at 5 stars. Assembly can take time – 6+ hours for some! To properly develop your chest muscle and improve strength, you need to be able to target it from a variety of angles. Fortunately, Golds Gym Platinum Smith Machine bench lets you do exactly this. You can easily adjust the bench to decline, flat, and incline. This means you can emphasize your lower pecs with the decline, and your upper chest with the incline. Furthermore, the flat setting enables you to work the entire chest as a whole. Having the ability to choose between different height angles puts you in the best position to develop an aesthetic and strong chest. The fact that it’s so easy to adjust means you can alter between each one within seconds at any time in your workout. The smith machine bench press isn’t the only way you can build a bigger and stronger chest. This home gym also comes with a great chest fly machine as well. 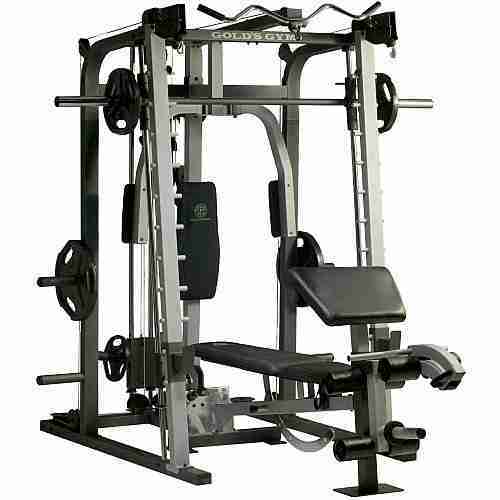 The smith machine is suited for overloading the muscle and using heavier weight for the muscle mass. However, Golds Gym have also paid attention to how users can get more detail in their chest. One of the ways to achieve this is by doing isolation exercises, like a chest fly. The smith machine press involves the shoulders and triceps to help you move the weight. Whereas the chest fly lets you focus 100% on the chest. You can get a good stretch and intense contraction. Many people love having different options to aid them in developing their muscles even further, and that’s what the chest fly feature offers. Biceps are a favourite muscle group that people love to train, right? Well, it also causes many people to use weights that are too heavy, and as a result, the form can end up being terrible. It’s common to see a lot of momentum and swinging being used to get the weight up. The shoulders tend to come forward and involve the front deltoids to help out. The preacher curl pad included with this home gym makes sure you can avoid all those things. It isolates your bicep muscles and ensures nothing else is being used to help. When your biceps are doing all the work, they’re going to grow a lot better. The pulley system can be used in either high or low settings. This leaves you with more options to get the most out of your workouts. Both the pulleys enable you to effortlessly attach different bars and ropes. The low pulley can be used for doing exercises like cable bicep curls and bent over rows. Whereas the high pulley lets you attach lat pull-down bars to workout your back. You could also use ropes to train your triceps too. There are so many possibilities with each of the pulleys that give you a lot to experiment with. The huge number of exercises you could do mean you can always keep your workouts fresh and inventive. I appreciated how Golds Gym Home Gym gives you the option to workout your legs. Many other home gyms are completely focused on the upper body. However, leaving the legs without any kind of stimulation can cause a lot of imbalances. The six-roll leg developer means you can develop your hamstrings and quads. However, it also involves the hip flexors and glutes. I loved how the six-roll leg developer gives you the chance to build more than just your quads. The quadriceps are seen as the biggest and most dominant leg muscles, but there are other parts that should be focused on too. Since you can strengthen your glutes, hips flexors, and hamstrings, I can’t help but feel Golds Gym have gone above and beyond to make sure new users can evenly build muscle across their entire body. One aspect about home gyms that people are concerned with is how easy they are to assemble. Unfortunately, customers have been struggling to put their Gold Gym Platinum Home Gyms together. The instructions that come with the home gym aren’t the problem. It comes down to the sheer amount of parts that need to be assembled perfectly. There are tons of little bolts and screws that need to be fitted in a specific order. So, if you mess up with one section, it could mean taking it apart and starting again. Many users find this to be a major headache and have spent many hours putting all the parts together. Some have spent 6-10 hours! Clearly, this can be off-putting as the whole point of home gyms is to make your life easier. Having said that, this largely comes down to the individual and their abilities to assemble large pieces of equipment like this one. Once the trouble of putting the home gym together was completed, numerous users noticed an issue immediately. As soon as they went to use the equipment with weights, they felt it was a little unstable. This is the last thing you want while working out as it could potentially lead to an injury, which is more common in the gym than many believe. The main issue with Golds Gym Platinum Home Gym is the construction. Some major parts of it are made using plastic. Understandably, people don’t come to expect this from the Golds Gym brand. The disappointing construction quality has left many wondering (myself included) why they’ve charged such a high price. While the huge variety of exercises is great, the entire structure doesn’t feel as heavy-duty as it should. What many customers don’t realise, before purchasing this home gym, is that it doesn’t come with any weights. So, if you were looking forward to using the smith machine, you better be prepared to spend more on the weights! This is also the case for many of the attachment features. However, even when you do get the weights on, the equipment feels like it’s only able to handle lighter weights. As soon as you begin to add heavier weight, this home gym begins to deteriorate in terms of its stability. 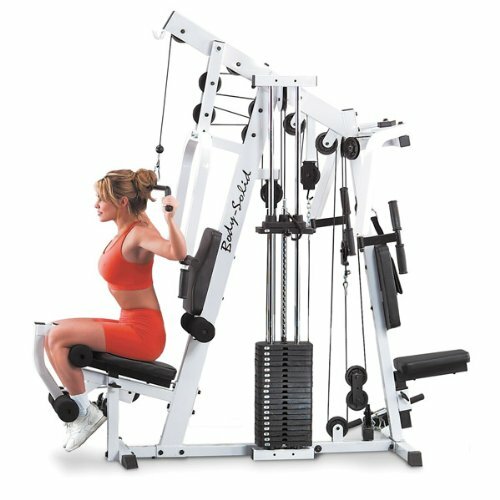 The smith machine doesn’t move up and down as smoothly and can even become off-centered in some cases. This comes back to the point that the Golds Gym Platinum home gym isn’t made for more serious lifters. The lower weight features will work well if you’re just starting out. But you will begin to feel held back once you start progressing onto heavier weights. All in all, this home gym doesn’t feel worthy of having the Golds Gym brand name. If you’re more of a serious lifter, I’d advise you to avoid this home gym and find one that’s constructed out of higher-quality steel. The StrengthTech EXM2500S Home Gym is a better choice for you. You’ll have less restrictions with how much weight you can use, and the entire set-up will feel a lot more stable. The impressive range of exercises on offer make this a more suitable option for people who are just beginning their weight lifting journey. You’re able to workout your whole body, which surprisingly includes the legs too! You’ll save money on gym memberships and you can workout more conveniently in your own home. Not having enough time to make it to the gym is no longer an excuse! Having said that, after some consistent use, you’re likely to outgrow this home gym within a year or two. So, if you’re after a one-off purchase that’s going to last you for years to come, Golds Gym Platinum Smith Machine home gym may not be the best choice. I hope this review has given you all the details you need to decide whether this home gym is right for you. Good luck!